Not to be confused with Prince Shōtoku. 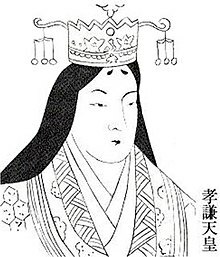 Empress Kōken (孝謙天皇, Kōken-tennō, 713 – August 28, 770), also known as Empress Shōtoku (称徳天皇, Shōtoku-tennō), was the 46th (with Empress Kōken name) and the 48th monarch of Japan (with Empress Shōtoku name), according to the traditional order of succession. Empress Kōken first reigned from 749 to 758, then, following the Fujiwara no Nakamaro Rebellion, she reascended the throne as Empress Shōtoku from 765 until her death in 770. Empress Kōken was involved in an affair with priest Dōkyō and appointed him Grand Minister in 764. In 766, he was promoted to Hōō (priestly emperor) and in 770 had tried to ascend the throne by himself. The death of the Empress and resistance from the aristocracy destroyed his plans. This incident was a reason for the later move of the Japanese capital from Nara (Heijō). In the history of Japan, Kōken/Shōtoku was the sixth of eight women to take on the role of empress regnant. The five female monarchs before Kōken/Shōtoku were Suiko, Kōgyoku/Saimei, Jitō, Genmei, and Genshō; and the two women sovereigns reigning after Kōken/Shōtoku were Meishō, and Go-Sakuramachi. Empress Kōken's personal name (imina) was Abe (阿倍). Her father was Emperor Shōmu, and her mother was Empress Kōmyō. Kōken is traditionally venerated at her tomb; the Imperial Household Agency designates Takano no Misasagi (高野陵, Takano Imperial Mausoleum), in Nara, Nara, as the location of Kōken's mausoleum. The site is publicly accessible. August 19, 749 (Tenpyō-kanpō 1, 2nd day of the 7th month): In the 25th year of Shōmu-tennō 's reign (聖武天皇二十五年), the emperor renounced his throne and the succession (senso) was received by his daughter. Shortly thereafter, Kōken is said to have acceded to the throne. 757: Conspiracy to overthrow Empress Kōken was not successful. 758: Kōken abdicated in favor of a cousin who would become known as Emperor Junnin. The Empress had reigned as for ten years. 764: In the sixth year of Junnin-tennō 's reign, the emperor was deposed by his adoptive mother, and the succession was received by former-Empress Kōken. January 26, 765 (Tenpyō-hōji 9, 1st day of the 1st month): Kōken formally reascended the throne (sokui) as Empress Shōtoku. August 28, 770 (Jingo-keiun 4, 4th day of the 8th month: Empress Shōtoku died at age 57, leaving the throne vacant. She was succeeded by her first cousin twice removed, Emperor Kōnin. Empress Shōtoku had reigned for five years. The years of Kōken's reign are more specifically identified by more than one era name. The years of Shōtoku's reign are more specifically identified by more than one era name. Koken's reign was turbulent, and she survived coup attempts by both Tachibana no Naramaro and Fujiwara no Nakamaro. Today, she is remembered chiefly for her alleged affair with a Buddhist monk named Dōkyō (道鏡), a man she honored with titles and power. An oracle from Usa Shrine, the shrine of the kami Hachiman (八幡) in Usa, is said to have proclaimed that the monk should be made emperor; but when the empress sent Wake no Kiyomaro (和気清麻呂) to verify the pronouncement, Hachiman decreed that only one of imperial blood should ascend to the throne. As with the seven other reigning empresses whose successors were most often selected from amongst the males of the paternal imperial bloodline, she was followed on the throne by a male cousin, which is why some conservative scholars argue that the women's reigns were temporary and that male-only succession tradition must be maintained in the 21st century. Empress Genmei, who was followed on the throne by her daughter, Empress Genshō, remains the sole exception to this conventional argument. She is also known for sponsoring the Hyakumantō Darani, one of the largest productions of printed works in early Japan. Otagi Nenbutsu-ji, a Buddhist temple in the Arashiyama neighborhood of Kyoto, was founded by Shōtoku in the middle of the eighth century. Taihō, Emi no Oshikatsu (formerly Fujiwara no Nakamaro). Sadaijin, Tachibana no Moroe (formerly Katsuragi-ō, Prince Katsuragi) (half brother of Empress Kōmyō). Udaijin, Fujiwara no Toyonari (first son of Fujiwara no Muchimaro). Udaijin, Fujiwara no Nakamaro (second son of Fujiwara no Muchimaro). ^ Brown and Ishida, pp. 274; Varley, p. 44; a distinct act of senso is unrecognized prior to Emperor Tenji; and all sovereigns except Jitō, Yōzei, Go-Toba, and Fushimi have senso and sokui in the same year until the reign of Emperor Go-Murakami. ^ Bender, Ross. (2009). "The Suppression of the Tachibana Naramaro Conspiracy," Japanese Journal of Religious Studies 37/2:223–245; compare mirrored full-text; retrieved 2012-10-23. ^ Brown and Ishida, pp. 276; Varley, p. 44, 145. ^ Brown and Ishida, p. 276 has the year as 769, 4th day of the 8th month, instead of 770. Believe this to be a typo, because Brown-Ishida's own timeline gives 770, and the Japanese Wikipedia article on Empress Kōken is using the 4th day of the 8th month of 770. ^ a b c d e Brown and Ishida, p. 276. ^ Bender, Ross. "The Hachiman Cult and the Dōkyō Incident," Monumenta Nipponica, Vol. 34, No. 2 (1979). pp. 125–153. ^ Bender, Ross. (2009). "The Suppression of the Tachibana Naramaro Conspiracy", Japanese Journal of Religious Studies 37/2:223–245; compare mirrored full-text; retrieved 2012-10-22. ^ "Life in the Cloudy Imperial Fishbowl", Japan Times. March 27, 2007. Imperial Household Agency (2004). 称徳天皇 高野陵 [Empress Shōtoku, Takano Imperial Mausoleum] (in Japanese). Retrieved February 4, 2011. This page was last edited on 5 June 2018, at 17:51 (UTC).